To me, the word "Arboretum" sounds so boring and scientific, but every time we go to our local arboretum, Tyler, we are far from bored. My kids and I love it there! 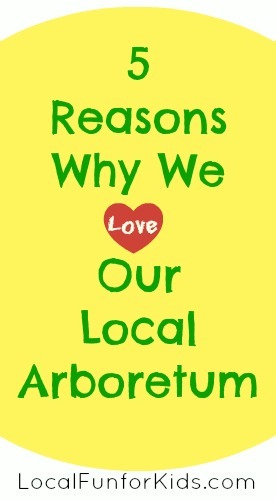 In a nutshell, "Arboretum" means collection of trees, yet, there is so much more for kids to see there. The exhibits are engaging, the flowers are plentiful and the trees are majestic. It's one of our favorite places to meet with friends and explore for hours. Whenever we go to the arboretum, it's a reminder that kids don't really need much to be entertained. As long as they're with friends, my kids are happy running through the wooded trails, playing with sticks and picking up stones. Isn't it nice when it really is that simple? 1. The kids can touch almost everything. My kids are very hands-on and don't mind getting dirty. It's nice to just let them play and be kids. Arboretums offer a multi-sensory experience. Tyler Arboetum website even says "Come and climb, explore and play in our Totally Terrific Tree Houses!" What more could a kid ask for? 2. They can be as loud as they want. No indoor voices are needed when you're outside in the woods! 3. We love the kid-friendly exhibits at Tyler Arboretum. The kids run up and down the steps of the tree houses and they were happy to have a rest with the Sit-a-Spell Exhibits. Everything is so inviting. 4. Yearly Memberships are very affordable. With your membership, you get unlimited, year round, free general admission and your contribution helps sustain the Arboretum. There are many membership options, and if you don't need a yearly membership, you can choose to buy a day pass instead. 5. It's the perfect place for kids to learn through play. They can learn about the evironment and the world around them. Also, sixty minutes of daily unstructured free play is essential to children’s physical and mental health. (American Academy of Pediatrics, 2008). Do you have any arboretums in your area? US National Arboretum - Washington, D.C.